Done by Joe Quesada, with Mike Manley on interiors, this splash-page debut of the new Batman was shocking because DC had actually done it. Actually removed both Bruce Wayne and the infamous, previously thought untouchable bat-suit. While Jean-Paul didn't seem such a fan of being a creature of the night on first looks with all that gold and those claws, in the initial issues the art team actually made it work. 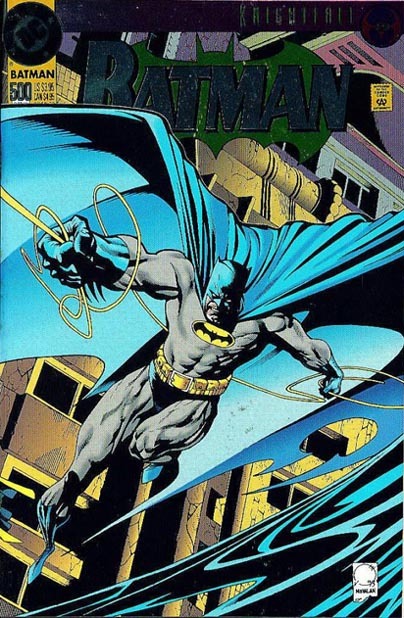 Will Jean-Paul's Bat-costume appear in The Dark Knight Rises? Probably not. However, Jean Paul himself would be quite a cool, if not unexpected surprise. Wow, this is really reminiscent of Daredevil's 'armour' costume. When did this hit the streets exactly (looks very 90s)? 1993. And I have this one too. Mike Manley's a very underrated, but steady artist. It was very 90's Robert - infact it was almost because of the success they had killing and replacing Superman, they tried to get lightning to strike twice, a little further down the road. 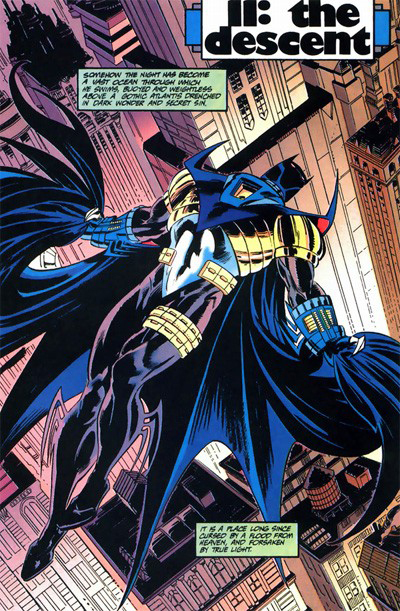 Didn't cause the same level up roar, but Knightfall did give us Azreal and help a Catwoman series eventually get started - so that alone makes it a success in my books! Dale is right. Mike Manley - who drew the second half is a mad machine bursting with talent. The first 25 issues of Darkhawk prove that. See how all roads lead back to Darkhawk guys? Marvel? Anybody?